The Q41 EAS is specifically designed for integration in carton folding machines. 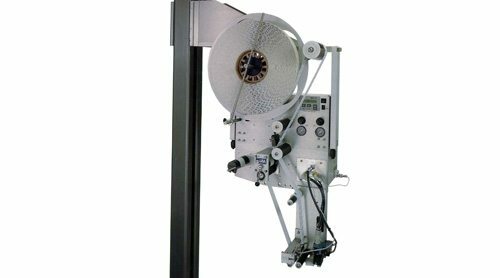 The Sensormatic and Checkpoint high speed label applicator is capable of dispensing all sensormatic (including the dual resonator as well as checkpoint (R.F.)) security tags. Changeover is quick and easy between the two most commonly used tags. This custom EAS applicator features a 20” diameter roll capacity and high-speed tamp/blow applicator module. An optional wipe-on module can be purchased for inflow labeling. Consult our Factory if you have an EAS tag application; we can modify nearly any of our labeling heads to dispense EAS tags.